This one's set in Italy. 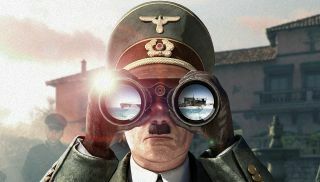 Sniper Elite 4 will be with us on, awww, Valentine's day, and if you pre-order it you'll be able to shatter Hitler's ballsack on a Nazi U-boat. You play these games for the story, of course, so if you've been dying to know why you'll be sniping folks in this latest Sniper Elite—other than 'because they're Nazis'—have a watch of the first story trailer, below. Chris seemed to enjoy his early look at Sniper Elite 4 back in March, while the previous games have gone down fairly well with our reviewers—here are Tyler Wilde's thoughts on the previous entry. This fourth one, the official site explains, "continues the series’ World War Two heritage by transporting players across the beautiful Italian peninsula, from sun-drenched Mediterranean coastal towns, to colossal Nazi mega structures, daunting forests and giddying mountain monasteries inspired by Monte Cassino. "Covert agent and elite marksman Karl Fairburne must fight alongside the brave men and women of the Italian Resistance to help free their country from the yoke of Fascism, and defeat a terrifying new threat with the potential to halt the Allied fightback in Europe before it’s even begun. If his mission fails, there will be no Operation Overlord, no D-Day landings, and no Victory in Europe". You see those stakes? Rebellion has just raised them a good few inches.